I have several ‘soapboxes’ that I tend to wheel out (if you can do such a thing!) when it comes to setting up to spout on about general attitudes towards children and their play. All of what you about to receive shall be spouted out from the soapbox that’s labelled ‘how children, by and large, come second’. Before I’ve written anything, it must be said that I am appreciative of the fact that we all share our urban and rural landscapes, adults and children alike, and that the former shouldn’t be neglected in their needs too; however, where children’s needs for use of those urban and rural areas are pretty much ignored or buried under the priority of the adult, this is the on-going concern. Children occupy a strange position in UK society (maybe also in the US and other countries too): the dominant rhetoric towards children is one of protection, yet when it comes to hearing their voices (in terms of what they want and need, but also quite literally in hearing their voices), or when it comes to giving thought to children as equally deserving of consideration in terms of ‘space’ use, for example, children are often the poor relations. What was it that George Orwell wrote? It was something along the lines of ‘all animals are equal, but some animals are more equal than others’. Including this photo in this post is in no way intended to be derogatory towards the people who live in this street. It is, rather, a statement on the attitudes towards children of those who built the housing development. On the one hand, sure, this ‘roadway’ is a ‘roadway’, and this car park is a car park; however, on the other hand, when I was ten, or thereabouts, this roadway and this car park would have been a pretty good approximation of a playground. When I was ten, or thereabouts, I rode my bike around my local estate’s roads and paths, and in between the houses along the alleyways (and if I’d have had a skateboard I’d probably have used that too, down the slopes, though I actually used some other fairly precarious contraptions found or contrived, speeding downhill, along the middle of the road, on my belly, my face three inches from the roadway, without brakes other than my shoes, with no means of turning other than with faith and blind luck, towards the hedge or the brick wall or the parked car, and so on). This photo doesn’t show a scene of a hill (alas), but the roadway is long with a few speed bumps, if I recall correctly (perfect for bike hops at speed, or kicking a ball along to see if it’ll go all the way to the end before touching a wall, or the like). 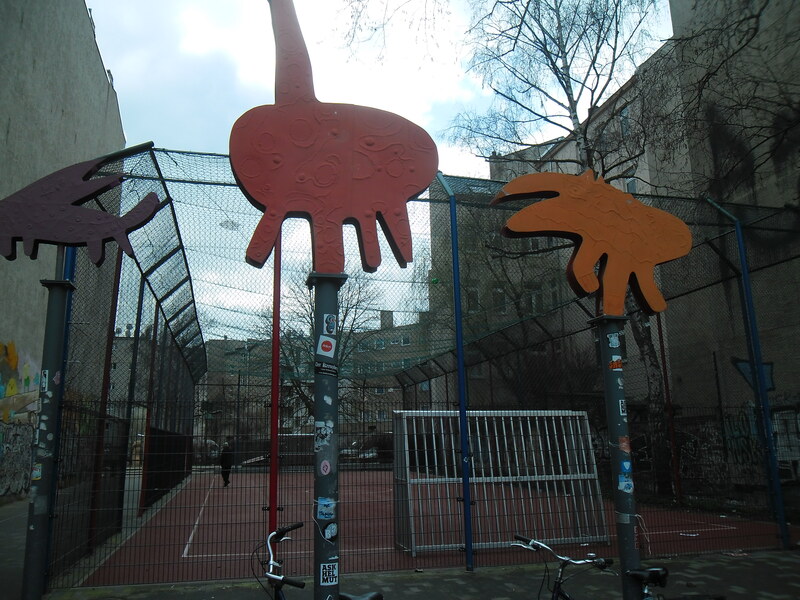 I’ve had a few informal and ad-hoc conversations with children recently about places of play. These are, admittedly, not part of any as-yet comprehensive study but, in discussion, the children tend towards the highlighting of what I’m thinking of as ‘destination places’: that is, parks, other large and bounded green spaces, other fenced-in environments such as school playgrounds and after school clubs. This is a shame, in some ways: what about all the other areas of in-between? What about, in the new interpretation, what I remember being told of what an old architecture school lecturer used to call ‘the toothpaste’ of a city (as opposed to its more tangible ‘monuments’)? Children in the city (and in the rural areas, let’s not forget) can get overlooked. That is, the preferences of their play and where that might happen (if permitted a greater luxury of finding out for themselves), can be seen as just not important enough or even not properly thought about at all. I wonder how many children are genuinely consulted on matters of public space, in comparison to the consultation of groups who are routinely considered as they who ‘should be consulted on matters of urban change’ such as ‘residents’ (that is, adults), ‘the elderly’, ‘the ethnic minorities’, ‘the youth’ (that is, teenagers), and so on. It’s not just the overlooking and ignoring that I find peculiar within this dominant combination rhetoric of ‘protection/lack of consultation or representation’: the general perspective on children could be seen to be children as ‘incapable’, ‘untrustable’, even borderline ‘stupid’. 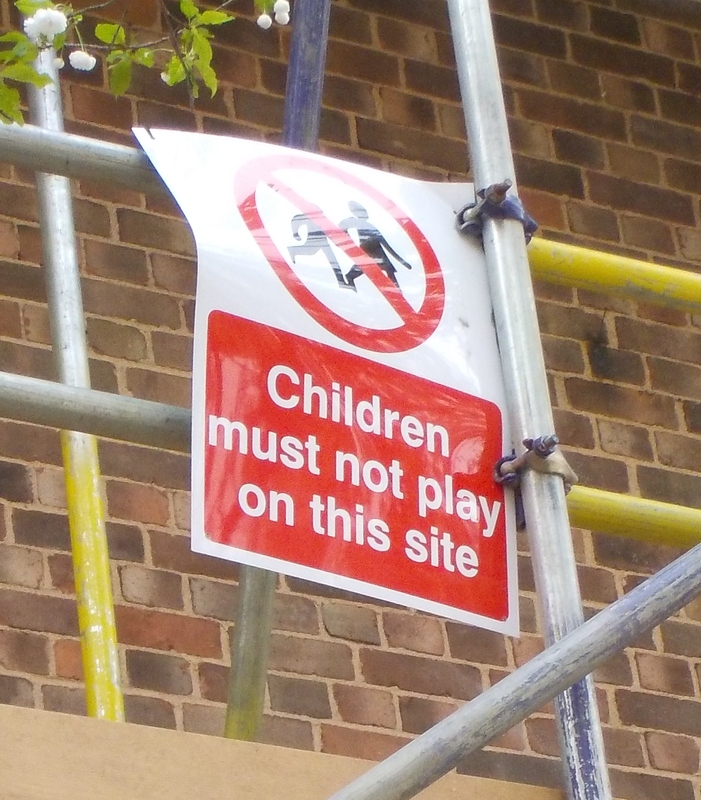 Whilst I’m not advocating that children should necessarily play on scaffolding, sure, what made me think is the sudden realisation of what would happen if I turned the sign on its head, as it were? 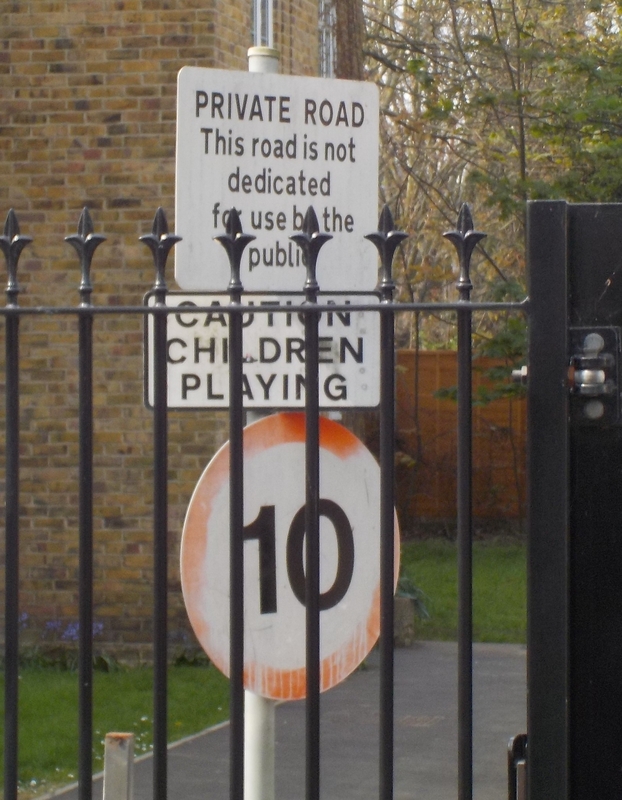 That is, sure, ‘children must not play on this site’, but what about adults? Can they play on this site? There’s no sign on the scaffolding to say that they can’t. Adults, it must be supposed here, are either socially competent enough to know not to play on such a site without a sign telling them otherwise, or they’re not in need of a sign because adults don’t play (really?! 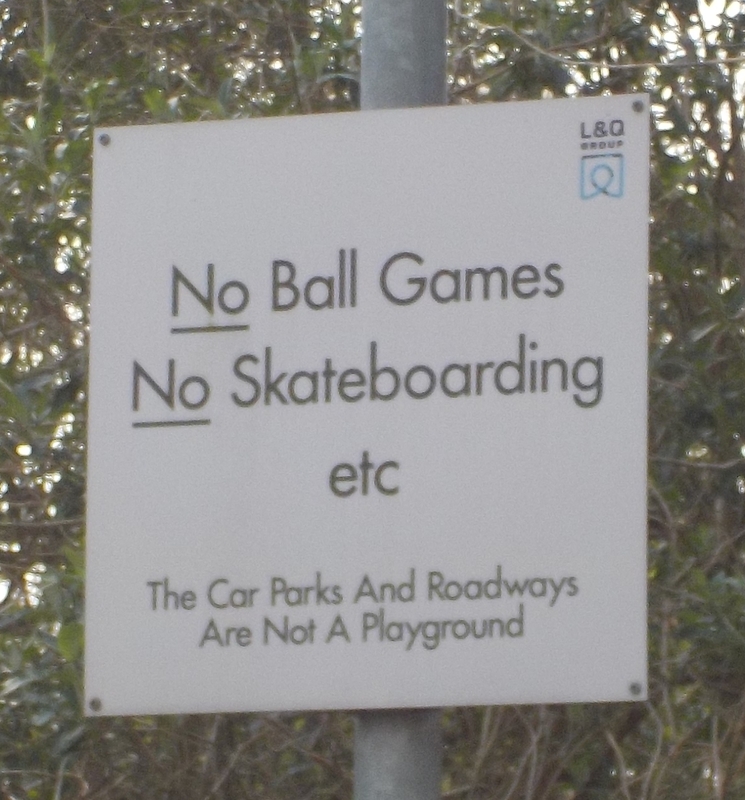 ), or actually adults are allowed to play there because there’s no sign to tell them otherwise. OK, so I’m being a little facetious, but in all seriousness it does beg the question as to the point of signs, and to the general attitude towards children as I perceive it. It’s a start, but better still would be a state of affairs where there were no need for such signs at all: it being implicitly understood that children may be playing in any give place, designated ‘playground’ or not (OK, maybe not on the dual carriageway, but you get my point); it being implicitly understood that children’s choices of play and places to play in may be very different to adults’ own places of play (yes, adults play too), or different to adults’ ideas of children’s places of play. The protection rhetoric, counter-intuitively, might even be better served this way; children, within this, would also be better listened to in adults’ appreciations of their preferences. Having just come out the other end of a full-on, hectic couple of weeks of open access Easter holidays on the playground, it’s safe to say that a few days rest has been very much needed. In such weeks of so much going on in the play, the not-so-play, and the not play at all for some, it’s often easy to miss the little moments that might otherwise pass us by. The playground has ebbed and flowed from the quiet first fifteen or twenty minutes each day of what, for a while now, I’ve called the children’s ‘poking around’ time, through the swell of the build-up of something taking shape in the group dynamic, right up to something (which in the moment feels) very edgy, teetering there either like the proverbial wave that won’t crash or falling over in some places like on stretches of the shore. 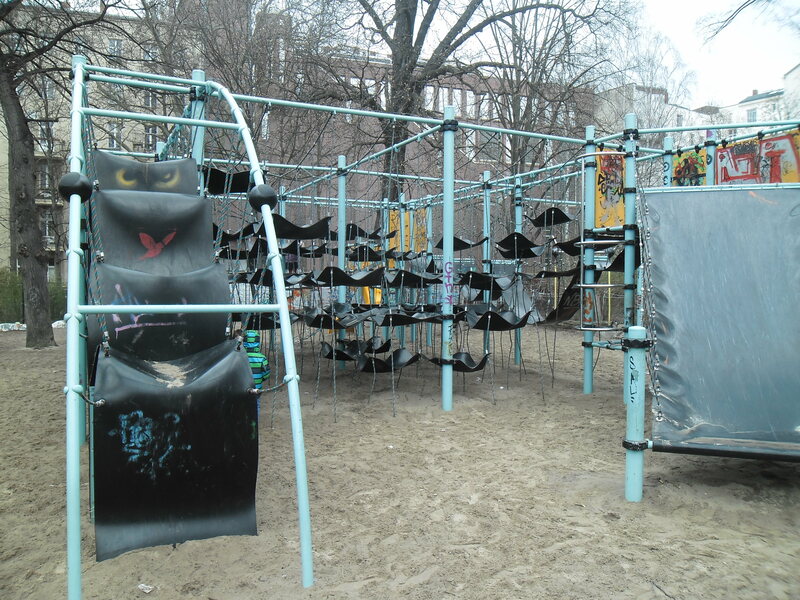 In this edgy, sometimes niggling, often fizzing state, the playground is one long anticipation of that something-ness that may or may not take off, when the day’s like this. These past few weeks there have been water balloons and factions, the hose pipe, water buckets (sometimes the buckets themselves being thrown), the filling of the pool table with water (‘for underwater pool’) and spadefuls of sand and dollops of paint thrown on for good measure too; there have been balls kicked blindly up high to land into crowds of unseen children on the other side of the site; the workmen in the road have had their patiences tested with children throwing bits of old piping over the foreman’s roof; palettes have been smashed; arguments have risen and fallen or grudges have sustained themselves over days. I often come back to the suggestion, when talking about playwork, that even on a calm day if you’re not going home mentally exhausted (from observing, at least), then maybe you’re not doing it right; the edgy days are even more exhausting. Not many of the children who attended this open access were also regular after school club children, but there were a few. One was a younger girl who I caught sight of, every now and then, as she just floated by and through the whole fizz and swill of everything else going on. I thought she might be bored or unsure. I don’t know, in truth. 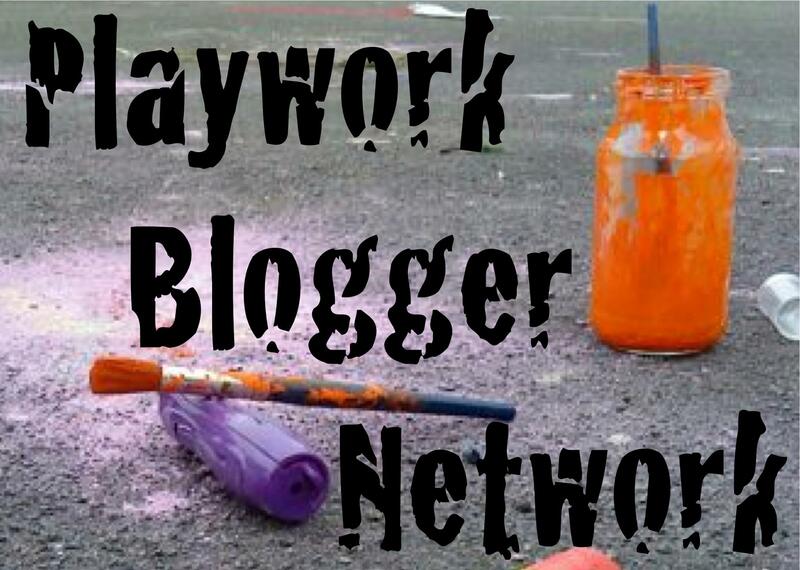 I offered her clay that was already out and stored on a high shelf, once, and she and her older sister took it to a corner of the playground and nothing of the edginess seemed to bother them out there. The younger sister had a serene disposition whenever she wandered through the place, as all manner of buckets and language flew around her and the playground. She wafted from one place to another, stopped (perhaps to see the way the world was from there) and disappeared for another hour or so. The same girl picked dandelions at the edge of the site near the zipline. A colleague caught my attention to show me this because he’d never seen it here before. Later, the girl picked dandelions elsewhere at another edge of the playground. She gave them to my colleague, and she laid more out on a long stretch of carpet that I’d put there in our set-up, by the hammock swing, because perhaps someone might lie on it. Another girl had been asking me and asking me to find her some slime powder for a while, and I hadn’t been able to achieve this because of everything that was happening at that time. Finally, I found the powder and put it in my pocket ready for when she was ready again. I saw her at the roundabout. She was lying in the centre of it in the sun. The other children there said she was asleep. She was dozing for sure, as the roundabout went slowly round. I cast a small shadow over her as I watched on, I remember, in my curiosity. There was no slime till the next day. A boy carried a hammer around with him all day, banging away at whatever he could find. I remember thinking that maybe he was testing us, but none of us were saying ‘don’t do this’. He kept the hammer with him and the banging gradually decreased. Near the end of the session he told me it was his lucky hammer. Earlier, he’d badgered me to help him make what he called a slingshot (but which was, as I later understood, a desire for a catapult, and which I understood in the moment as a ‘see-saw’). He wanted to nail two pieces of wood together and I said go do that but maybe a Y-shaped strong piece of branch would work out for the task. He didn’t have much enthusiasm for finding this. After the weekend, he searched again and came back and back with progressively stronger Y-shaped wood. I wondered if he’d been thinking about it all that time. We fitted it with elastic bands and duct tape to tie them together. He had his catapult/slingshot, and the lucky hammer didn’t re-emerge. Three boys found the stash of powder paints in the storage container. I’d seen one of the boys in this sort of play before: that is, he likes to dip his hand into the paint and throw it to the breeze and cover himself in the process. The boys engaged in the powder paint play around the playground, getting themselves good and dusted in brown (being the choice of the moment). Later, the boys were in the container again and there was powder paint of various colours a good half-inch thick covering the floor. ‘What has happened here?’ I asked them in a manner I hoped would be taken for its intention as observation rather than admonishment. ‘Fun has happened here,’ said the boy. We’d noted the festival nature of the play in our conversations earlier. One day, and briefly, I caught sight of a small group of younger girls who had swept the boards that now cover the old fire pit, where we’d left a trestle table which had accumulated bits and bobs and which they’d removed. They’d positioned wooden cabinets at the corners, turned inwards, and neatly created some outside room without the walls. They were busy painting the furniture. I walked on by and didn’t see this again. Somewhere along the line, one of the boys decided that it would be a good idea to put a live worm in an old tin can and roast it alive on the fire. There were some brief discussions between myself and some of the children, though I left them to make their own decisions. Later, I was talking unconnected things with a parent nearby and, as I did so, I overheard two children behind me as they sat on the mound of earth at the entrance gate. They were digging for worms and I couldn’t concentrate so well on the parent because I wanted to hear what the children were saying. There was general talk of worms and God, and ethical scraps that passed me by, but which I wanted to hear more of. Two girls spent some considerable time, over a period of a couple of days, grappling with a socket set to extricate the bolts that held the tyres onto the swings. 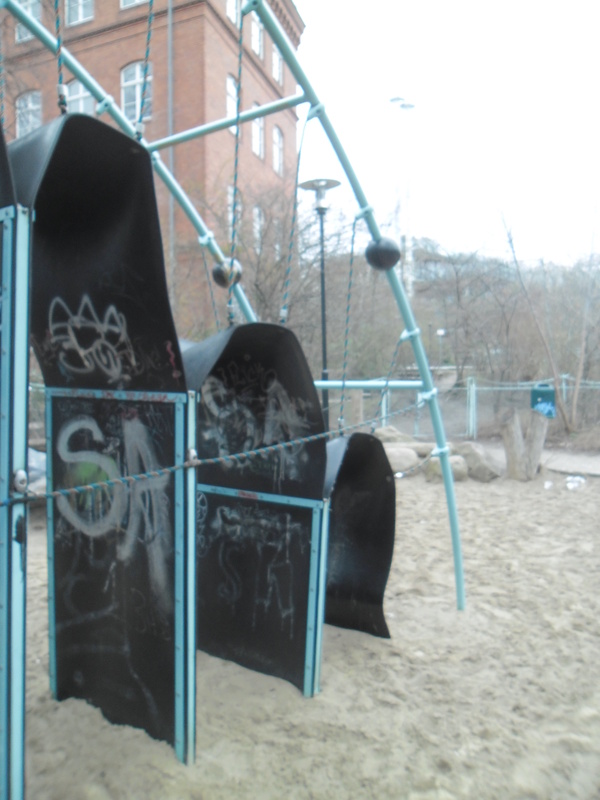 There was a general consensus of a small section of children that the swings would be better this way. The girls finally freed the tyres ready for a colleague to unhook the chains from the beams. Later, or another day, I caught sight of the swings going high without the extra weight of the tyres on them, sometimes with just one child swinging almost horizontally, sometimes with all of the swings used by children at the same time, synchronised to meet in the middle of the frame structure at their highest point, their toes. Once I heard, in passing, the lull of a song as a group of older girls swung. We have a piano positioned in the alcove between the tool shed and the main door towards the office and just behind where the children like to have the pool table out in the sun. Every so often a child could be seen or heard there, tinkling away at a few notes. One child, late in the week, diligently repeated the same refrain, over and over. It was a small repetition of notes and nobody bothered him. He came and went. I came and went. It was the end of a session, one day, and one of the younger girls had found some blue powder paint near the fire exit and the storage container. She set about covering her skin with it as we bustled by, as children used up every last minute they had left on site in their darting to the toilet tap to fill up balloons, and as we were trying to usher everyone out. The girl stood in amongst it all with a big grin on her face. I stopped to see and she made me smile, her just looking like a big smurf, as she did! One of the older girls of her family screamed at her to ‘wash it off, now!’ She was in parental mode, as has often happened. For a few days, for twenty minutes or so at a time, this same younger girl sat herself down on a low platform in the middle of the playground, after a quick trip to the tool shed, and proceeded to bang nails into the wood for no reason other than to bang nails into wood. When she was done she was done, until the next time. A long time back at the very beginning of the open access days, one of the girls found a pan. I saw her a little while later with her pan filled with bubbles (or, as some children call the washing up liquid for the water slide: soap). She headed for a colleague who was sat on one of the old people’s chairs that was later to take a battering by having its back broken somehow. The girl smiled with her bubbles, looking at the hatless, hairless victim that was my colleague sat in the chair. My observations moved along . . . In amongst the edginess, the hectic dynamic of the ebb and flow and swill and play, and not-so-play, and not play at all for some, it’s often easy to miss the little moments that might otherwise pass us by. There have been challenges these past few weeks, but there have been these moments too, and more. They rise to the surface. During a recent trip to Berlin, Germany, I met old friends and submerged myself on the tourist trail (along which I readily engaged in what an old architecture school tutor used to call the obligatory ‘Kodak Spots’ — photographing the well-known places then moving on: Brandenburg Gate, what remains of the Berlin Wall, the site of Checkpoint Charlie); as I went though, I also felt a need to take passing photos of various playgrounds. I didn’t know what I was going to do with this documenting, as ad hoc as it was, or what conclusions I might draw from it. I’ve now had a little time to sit on it all and think it over a little. 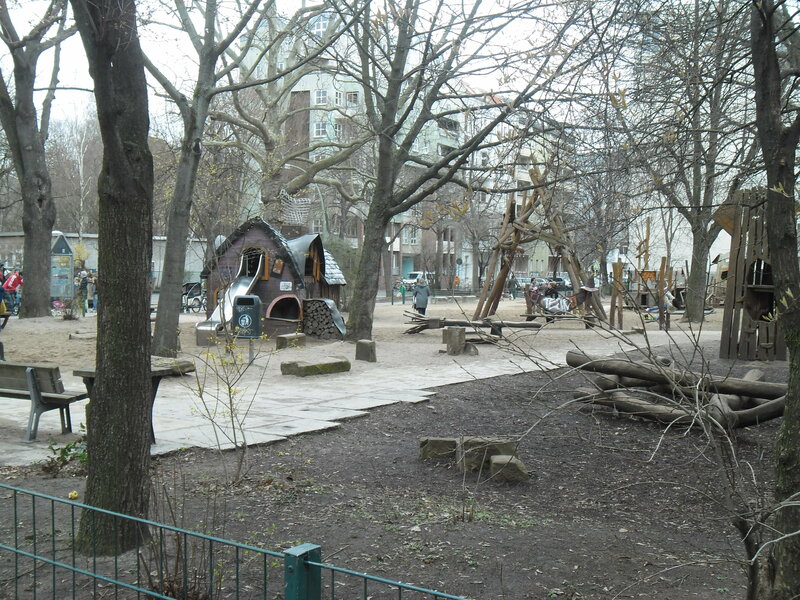 When we pass by places set by for children to play or be in, we should trust that voice inside us that may tell us what we might feel like as a child in that place ourselves. Adults of the world too often dismiss the world of the child, and in so doing they forget about themselves: that is, they forget about the fact that they were once a child too. It wouldn’t do any harm to see the world through children’s eyes a little more. A good way to start is to look at the world through the eyes of the child that you were yourself. 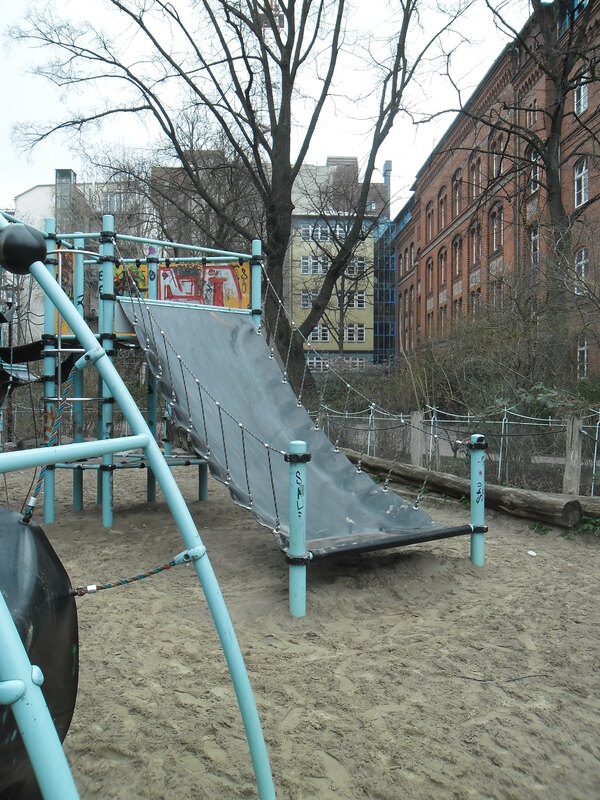 As such, without any great in-the-moment analysis, my latent child’s interest in places set by for play was taken a couple of times in Berlin, for different reasons, although there were also occasions of the opposite happening too. 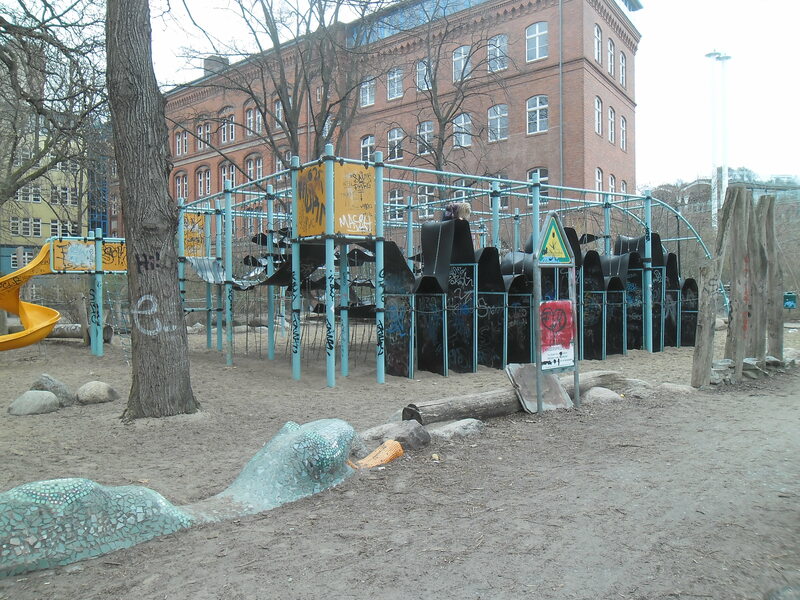 It seems that this latter disaffection, created by a general adult disposition towards how to cater for children in the urban environment, is played out across many cities and countries. Pockets of space are given over, sure, but it sometimes feels squeezed in, thought of after the buildings. The positive spin on this is at least there are pockets of space given over. There are questions of functional necessities (such as high fences for football pitches) . . .
. . . but when is a ‘pitch’ actually a ‘pitch’, and why do some function elements have to be so reminiscent of keeping ‘dangerous individuals’ (that is, here, children) away from the good and law-abiding others? I don’t know what the blobby dinosaur shapes are all about here, but maybe they’re intended to soften the blow of all of the above. 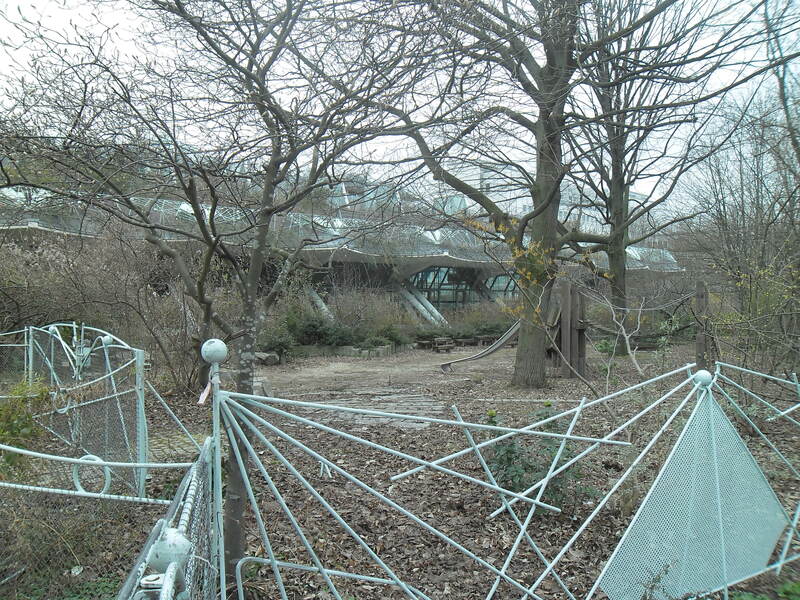 A lack of fences is all very well, but what the ground contains is also due some consideration. All cities seem to be forever changing themselves, turning themselves continuously inside-out in the building and re-building, but what then happens is little pieces of the city (and little pieces of the populace, e.g. children) get either marginalised or they cling on bloody-mindedly in amongst it all. My in-the-moment thinking was what it might be like to be up on these odd rubber walkways, but my adult analysis also kicked in when observing a lack of barriers above the UK fall height of two metres. I’ve only just noticed that there’s a child in one of these pictures looking out over the edge. 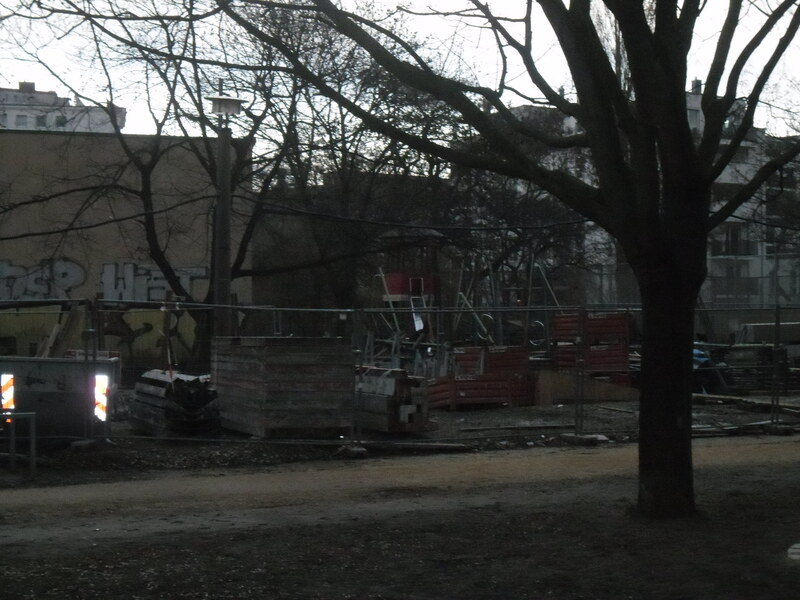 Here, it seems, is some form of fusion of thoughts on this latent child’s in-the-moment stimulus, fencing and defensible space, and considerations of the child in the city. As a child here I would probably have hid myself in amongst the trees, just to watch out and see! 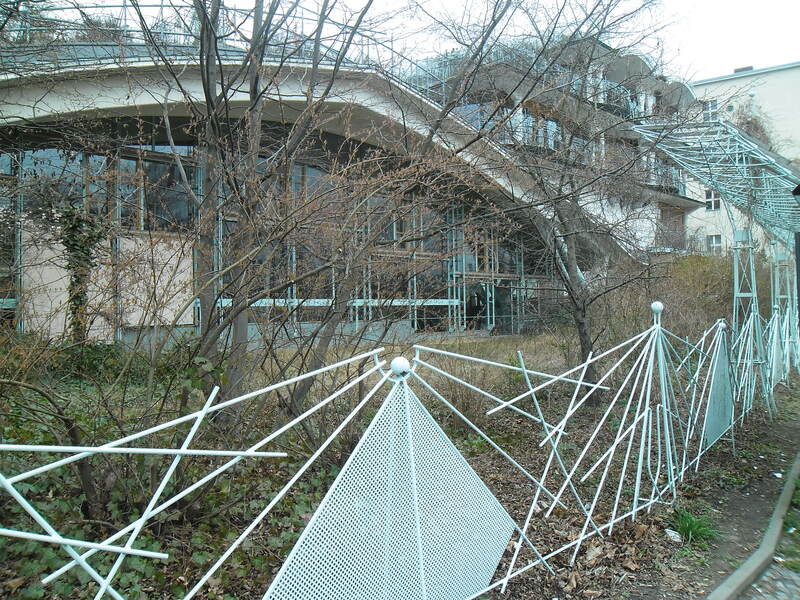 I was taken, in my relaxed state, by the design of the fences (which were, admittedly, still fences marking boundaries of areas in un-Swedish-like ways), replicating the landscape somewhat. 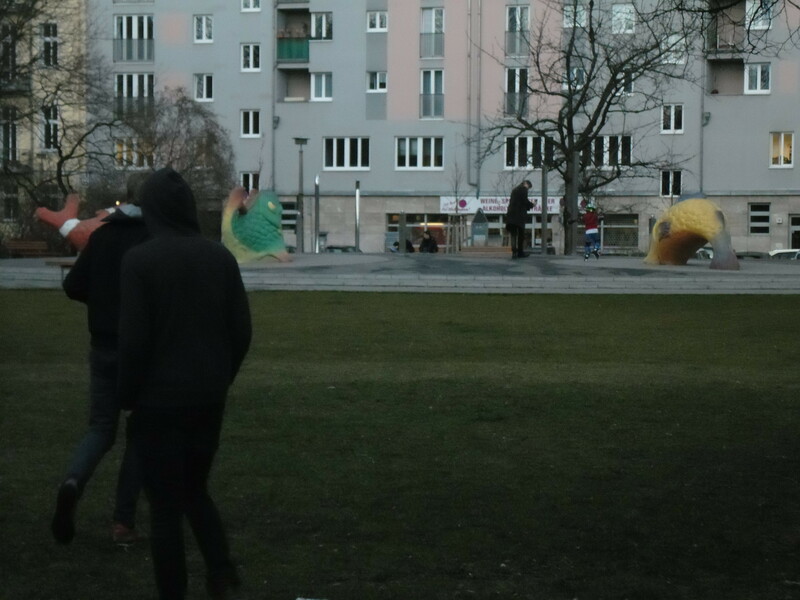 The place felt, in the immediacy, more tangible to a human-ness of experiencing the world than many of the stark concrete blocks of the former East Berlin and the grandiose town houses of the former West of the city. 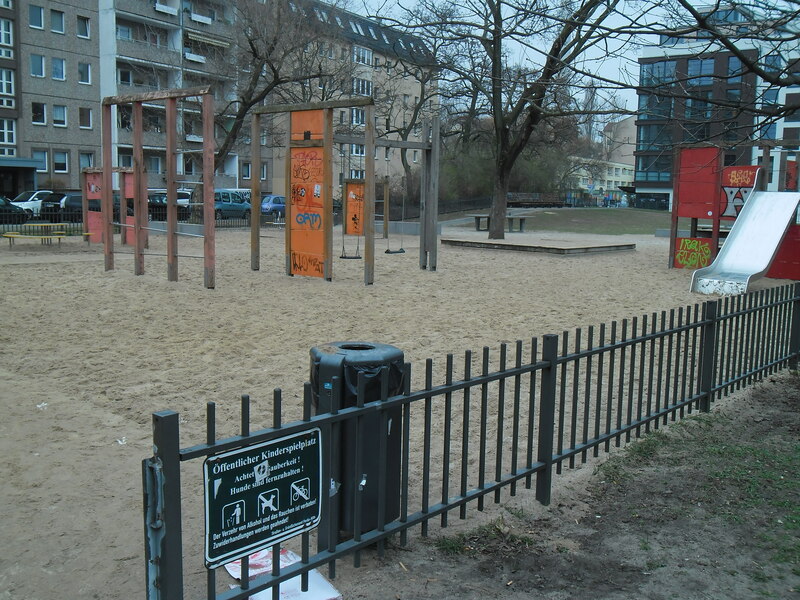 Berlin, in these snapshots, demarcates children’s useable/allowed space from that of the adults in the same way that probably every other city in the world does, though there are instances of novelty and stimulus to be found. What would be truly inspiring, however, is if the adult populace of cities (being the ones who currently exert formalised control over such things as urban planning) worked more towards acceptance of the blending of spatial needs: those of children as well as adults. Yes, this is somewhat Utopian but not impossible. This is not to say that children aren’t being given the opportunity to play out there in the world at all (sitting in a pub at a busy intersection in Shepherd’s Bush, London, whilst the circus are camped out on the Green, on a late sunny afternoon during a school holiday, observing all the play between the roads and the circus fence, goes some way to showing this, though those children are still ‘hemmed in’ to a degree): what this all is to say is that tolerance of play should be the norm, not the exception; that children squeezed in to spaces between buildings, fenced off from the city for reasons of corralling, is disingenuous to the popular refrain of ‘putting children first’.